The Nisei were the second generation of Japanese to call America home. This generation was both Japanese and American in attitude and cultural heritage. Many of the young Nisei worked alongside their parents on family farms, in store front businesses, and in the timber mills while attending the local public school. On December 7, 1941, the attack on Pearl Harbor found the Nisei and their parents in a difficult situation. Fear of an attack by Japanese naval forces on the West Coast and resentment against them in California led some people to clamor for people of Japanese ancestry to be removed. Although Japanese American leaders had denounced the attack on Pearl Harbor and some civilian and military leaders voiced their support towards the Japanese Americans, political pressure from California congressmen, the media and the public to remove the Japanese from the West Coast was growing stronger. On February 19, 1942, President Franklin D. Roosevelt signed Executive Order 9066. This decree gave the military the authority to exclude people from designated areas to prevent sabotage and espionage, but President Roosevelt knew that it would be used to remove people of Japanese ancestry from the West Coast. 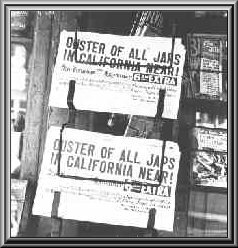 The army and the Wartime Civil Control Administration (WCCA), the civilian branch of the Western Defense Command, began the process of notifying and rounding up all persons of Japanese ancestry on the West Coast into sixteen assembly centers for processing and placement into ten internment camps. Some of the Japanese Americans were able to get sympathetic neighbors and friends to take care of their homes, farms and businesses. Many of the Japanese Americans lost a lifetime of hard work as they quickly sold their homes, farms, businesses and possessions. They were allowed to take one trunk full of clothes and possessions, but certain personal items such as radios and cameras were forbidden. The internment camps were located away from West Coast cities in desolate locations like Minidoka, Idaho and Tule Lake, California. Quickly constructed with crudely built barracks, barbed wire fences and armed guards the internment camps appeared more like prisoner of war camps. Over 120,000 people were moved into the camps. Anxious to prove their loyalty to the United States the Nisei reluctantly accepted internment. Further complicating matters for the interned Japanese Americans occurred in February, 1943, when teams of Army officers and enlisted men visited the relocation centers to register draft age men for military service and others for non-military duty such as the Army Nurse Corps and WACs. Over 33,000 Nisei soldiers served in the American army during the war. Nisei soldiers were used in the Pacific Theater as interpreters as well as in combat in North Africa, Italy and France. The principle units in which the Nisei served were the 100th Infantry Battalion, which was formed in Hawaii, the 442nd Regimental Combat Team, formed from volunteers from the internment camps, and the secret Nisei Military Intelligence Service whose members served with army and navy units from the Aleutians to the far reaches of the south Pacific. The Nisei soldiers became famous for their heroism and the high number of casualties they sustained in combat. The 442nd/100th sustained 9,486 wounded and over 600 killed suffered, the highest casualty rate of any American unit during the war. For their heroism, the men of the 442nd/100th won fifty-two Distinguished Service Crosses, 560 Silver Stars and the Congressional Medal of Honor was awarded posthumously to Pfc. Sadao Munemori. The 442nd Regimental Combat Team also won seven coveted Presidential Unit Citations for its performance. The men in the 100th Battalion alone had earned 900 Purple Hearts, thirty-six Silver Stars, twenty-one Bronze Stars, and three Distinguished Service Crosses. It is from this background that 14 extraordinary brave young men serving in the "Nisei Military Intelligence Service" volunteered for a "Dangerous and Hazardous Mission" and became members of the 5307th Composite Unit Provisional, better known as Merrill's Marauders. Assigned 2 to each of the six combat teams and 2 to the Headquarters, these men continuously performed acts of heroism while fighting against the Japanese Army in the jungle and mountains of Northern Burma. Thanks to the "National Japanese American Historical Society". for providing a large part of the information and graphics for this page. Click on NJAHS emblem above. the 55 that accepted this honor are listed below.